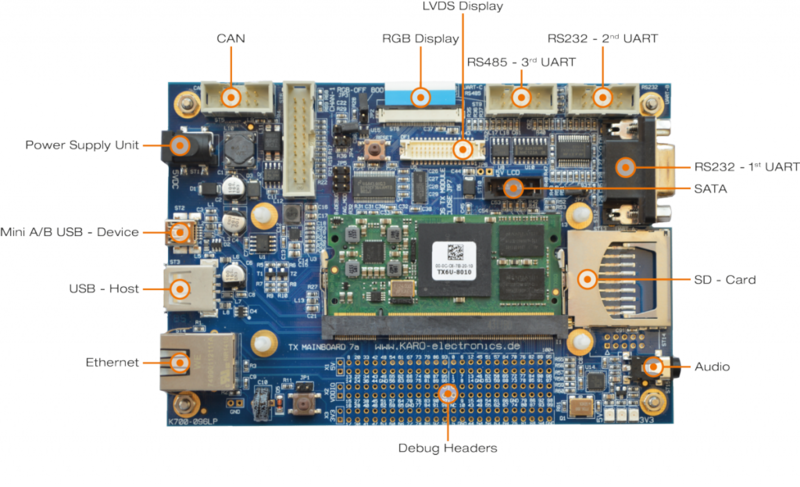 Mainboard-7 provides a complete development environment for TRITON-TX modules, including those based on i.MX25, i.MX28, TI AM3354, i.MX53 and i.MX6, i.MX6 UltraLite or i.MX8 whether running Linux, Windows Embedded CE 6.0 or Windows Embedded Compact 7 / 2013, Windows 10 IoT Core or QNX. Mainboard-7 ships with the required module and operating syst em installed and running. The development system consists of a baseboard which provides connectors for the main module interfaces. All 200 module SODIMM pins are accessible as header locations. There are connectors for Ethernet, USB Host and Device, 2x RS-232, RS-485 and CAN, as well as an SD Card. 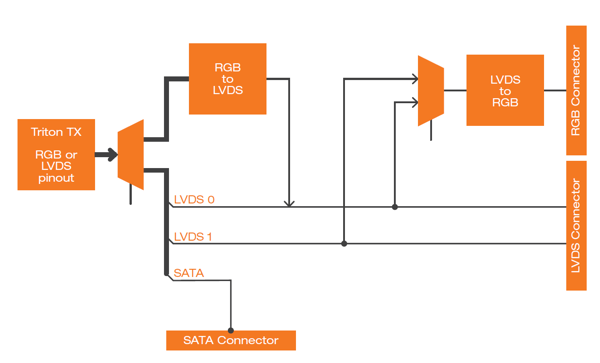 An LVDS port is provided for flexible display connectivity, as well as a parallel RGB port for specific touch-screens. Audio in/out, SATA and JTAG are also available. Please note that some BSPs may only support a subset of interfaces out of the box. For production purposes, a custom baseboard is created from the supplied Mainboard-7 PDF schematics. We are happy to offer baseboard design and manufacture as a service, as well as checking of a customer’s own baseboard design. As well as an optional standard 5.7″ 640 x 480 screen, the Mainboard-7 can be used with a range of compatible resistive and capacitive touch panels. Available sizes ranges from 3.5” to 7”, and resolutions include 320 x 240, 480 x 272, 640 x 480 and 800 x 480. The display parameters can be adjusted by the user to accommodate different screen resolutions, and to support third party displays. Please call or email us to discuss your specific requirement, and to check on 3rd party screen support. Contact our experienced team with your detailed questions – we’ll be happy to help. For pricing, please don’t hesitate to ask us for a quotation. Please contact us via the links at the foot of the page. Mainboard-7 can be purchased online via the links at the bottom of the individual TRITON-TX pages.